Despite the growing attention given to community-based initiatives in the delivery of public services, little is known about their durability. 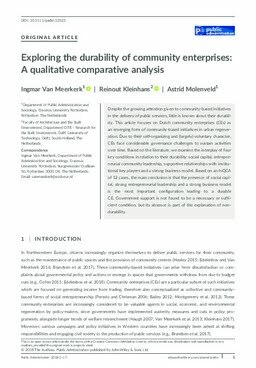 This article focuses on Dutch community enterprises (CEs) as an emerging form of community-based initiatives in urban regeneration. Due to their self-organizing and (largely) voluntary character, CEs face considerable governance challenges to sustain activities over time. Based on the literature, we examine the interplay of four key conditions in relation to their durability: social capital, entrepreneurial community leadership, supportive relationships with institutional key players and a strong business model. Based on an fsQCA of 12 cases, the main conclusion is that the presence of social capital, strong entrepreneurial leadership and a strong business model is the most important configuration leading to a durable CE. Government support is not found to be a necessary or sufficient condition, but its absence is part of the explanation of nondurability.